You’re certainly no new-comer to the board game space. One might go so far as to say you were one of those who were board games before they were cool. Now there are, understating matters, a whole lot of companies out there competing for attention and money. Why create a new company right now? In 2000, when I founded Eagle Games, I believed that there was a potential demand for High-Quality Miniatures Games with beautiful artwork and great production values. Apparently I was right, only I was about 15 years too soon. Because of Kickstarter and the growth in consumer awareness of modern board games, there are more people playing high-end board games than ever before. There are also far more new board games than ever before. However, many of the new designs are created by gamers, for gamers. The new opportunity that I believe exists, is the opportunity to provide the large number of more casual board game fans with high-quality gateway games that will allow them access to a wider library of games aimed at them. And the significance of the name? Names are hard. When Jason and I were brainstorming the name of the new company, we made list after list. Some of the names sounded like fifty other publisher names, and the rest sounded like a hundred other publisher names. We tried cute, funny, whimsical, clever, not-so-clever…and eventually landed on ‘Forbidden’. The significance? We didn’t hate it, and we could do some fun things with branding. Your partner in Forbidden Games, Jason Kapalka, was one of the principals behind PopCap games. As most I suspect know, PopCap gave the world the monster that is “Bejeweled” and a number of other smaller mobile games. You, yourself, “did some time” at PopCap. What did your (plural) tenure in that game space teach you about the gaming industry and board games in particular? Games should be fun (designers too often forget this simple rule). Good Games are ‘sticky’. In other words, they have an addictive quality engineered into them so that the player has a reason to keep playing them. (I’m going to cheat and include a rule that I learned from Sid Meier): Good Games are full of interesting decisions. Players want to be the hero of the story and they want their decisions to matter. Making a good game requires a lot of work and re-design to get it right. The first game from a new company is a pretty big deal. 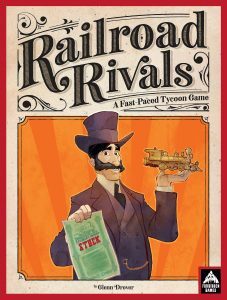 Forbidden Games’ first offering is “Railroad Rivals”. What’s it about and why did you choose it? I was trying to come up with a simple tile-laying game that would appeal to casual and hard-core gamers alike. I was exploring the idea of a game with the elegant simplicity of dominoes’ tile matching mechanic, but with a little more depth. And of course it needed a theme that appealed to a broad audience. The idea hit me like a ton of bricks: a game with all of the favorite elements of classic Railroad Games (Track Building, Connecting Cities, Delivering, and Stock), but could be learned in 5 minutes and played in 45 – 60 minutes. Any thoughts re: what is it about the railroad as a theme that has spawned so many games? Railroads hold a magical place in the history of America (as well as many other countries). There is a great deal of nostalgia for steam locomotives and for the famous railroads of yesterday. That’s why I wanted to include 12 of the most famous Railroads in American History. Railroads also spurred the westward expansion, and played a key role in the growth of many American cities. And this is why I thought that it would be amazing to have each of the 37 city tiles in the game feature a unique building from that city around the turn of the century. I enlisted the help of an artist/ architect friend of mine (Renato Imana) to do the heavy lifting research. He then worked with our graphic designer (Jacoby O’Connor) to hand-illustrate each one. Finally, we got Mark Page, an extremely talented artist who works at Disney, to colorize them. The result is stunning, educational, and just plain cool. You’ve got a couple of other games listed on the Forbidden Games website as future releases. They all look to be light-to-medium-weight Euro-type games. Is it fair to say that’s where most of Forbidden Games’ offerings will fall? Exactly: As I mentioned above, we are trying to create high-end gateway games that will also appeal to gamers looking for games in that light-to-medium weight range. We will throw a curveball in there from time to time as well. I love historical strategy games too much to totally ignore them. (Author’s Note: Yes!). 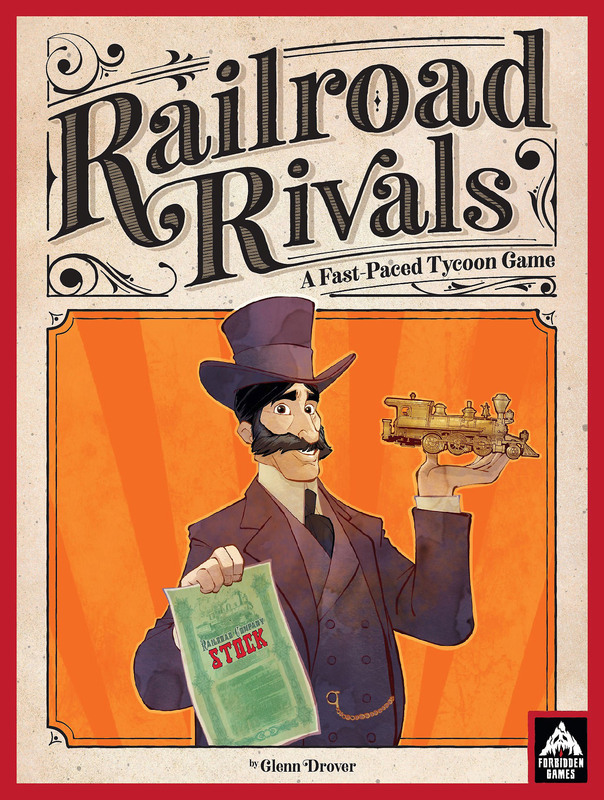 You’re taking “Railroad Rivals” to Kickstarter March 20. You’ve launched at least one other game I can think of that way. May we assume you’re going to follow that path as you launch your future games? Our strategy is to lead with Kickstarter, and follow-up with retail. I’ve been a retail biz guy throughout my career, and I value the visibility and consumer reach that retail offers. If folks don’t know your secret, I’m telling it now: you have real grognard cred. Among other things, you had one of the loveliest collections of 28mm Napoleonic soldiers I’ve ever seen and owned enough of them to mount a credible Battle of Leipzig. I’ve yet to forgive you for selling it. Your profile picture on your new website looks conspicuously like my beloved Corsican emperor. Tell us the truth: is there any mass market future for groggy gaming or are we forever a cul-de-sac? Groggy Gaming took a real step forward with Command and Colors/ BattleCry (designed by Richard Borg). But even that system couldn’t be confused as ‘mass market’. Let’s just say that historical wargaming has a ‘particular’ appeal. My new 18mm Napoleonic collection that replaced the 28s is now almost complete, and is IMHO even more delicious and epic than its predecessor. (Author’s Note: They are very lovely, but he is wrong about this.) You have an open invitation to give it a test-drive. I wouldn’t be me if I didn’t ask you about “Victory and Glory: Napoleon in Europe” which I’ve long taken to be a re-imagining of your classic “Napoleon in Europe”. I take from your Kickstarter page that people will soon have it in their hands. Looking now at the telescope backwards, how’d this project go? So I spent months trying to re-design the game to make it more playable. Eventually I got the playtime down to 12 hours…ugh! Immediately after that playtest, I returned home and stripped the game bare. I kept all of the great Napoleonic theme and events that fueled the card deck, but reduced the game mechanics to their most basic elements. And lo and behold, the fun showed up. The finished game is now a brisk two-hour heads-up contest, and a nail-biter. The card-driven mechanic most closely resembles the one in Twilight Struggle (though not exactly). The decision to spend the time necessary to get it right was a tough one, but it was the right one. It is a much tighter and better game than Napoleon in Europe. 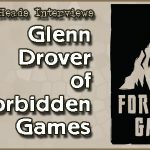 Short-term and long-term, what are your hopes for Forbidden Games? Or, as our trainers ask us in government, what does success look like for you? I hope that I can design games that entertain a lot of people. I believe that I’m a better designer now than I was at Eagle 14 years ago. The games that we are creating at Forbidden will be absolutely beautiful. We have contracted with some amazing artists: Mark Page (Disney), Brian Kesinger (Disney), Annie Stegg Gerard, Keith Rocco, and our own Jacoby O’Connor who has done the graphic design on every game that I’ve designed for the last 18 years. Thanks very much to Glenn for taking the time.